We are open from 8.45 until 3.15pm and offer additional wrap around care with our sister company Busy Lizzies Kids Club providing Breakfast, After School and Holiday Club. You can choose any combination of sessions, to suit your needs. We accept all childcare vouchers and payment plans are available upon request. A minimum of 3 sessions is required to start at the Playgroup. Our sister company Busy lizzies kids club provides wrap around care, offering Breakfast, Afterschool and Holiday Clubs, all held at Bengeo School. Breakfast and Afterschool club for Playgroup and Nursery, please visit www.busylizzieskidsclub.co.uk for more info. Two year old funding is available (free 15 hours), to see if you are eligible please visit www.hertsdirect.org and search for 2 year funding. Please note the term after your child turns 3, ALL children are entitled to 15 hours of childcare and some children are entitled to 30. If you are receiving more hours than your 15/30 hour entitlement, lunch club is then charged at £3.00 per day. If you are eligible you will be given a print out and a reference which must be sent in with your application form or forwarded on to Liz Llewellyn at bengeoplaygroup@gmail.com. 2 year funding is subject to availability and conditions of suitability may change throughout the year. What will my child do during each session? 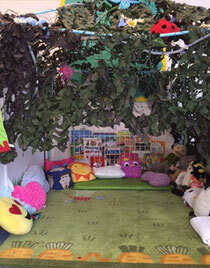 The children enjoy a mixture of free flow and structured play with a large variety of toys, bikes, puzzles, ICT, Construction sets, dressing up, singing and music. 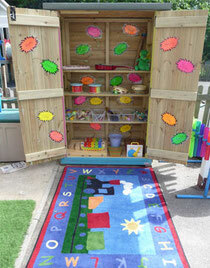 Provision is also made for creative activities as well as all kinds of ‘messy play’. The secure courtyard and playground gives the opportunity for plenty of outdoors play. 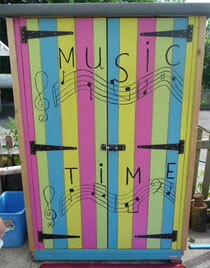 Our courtyard is partially covered so free flow play can be offered all year round, whatever the weather. We also visit the schools secure Jubilee Gardens and regularly have our snack and story time there after whizzing round on a variety of bikes , scooters and ride ons. We have circle time during each session where all the children are encouraged to sit down together, where they can do their show and tell and have a story read to them. Circle time is a nice way for the children to get together with their friends and share experiences and is a firm favourite with the children. A healthy snack and a drink of milk or water are served both morning and afternoon and children are requested to bring a packed lunch if they are staying for lunch club. Sitting down at a table provides wonderful times for conversation and questions with friends and is also a great opportunity to learn good table manners. We also discuss healthy eating with the children. We operate an open door policy and fathers/mothers/carers are always welcome to stay and enjoy the session with their child.